From Minneapolis/St. Paul, Minnesota, the Melismatics play Power Pop music and having known them from day one, it's safe to say, they are one hell of a band. Since 2000, The Melismatics and their music have stood the test of time, moving steadily up the ladder in the strong Twin Cities music scene over the years to be one of the best Minnesota has to offer in the world of Pop music. This interview was conducted at SXSW central in the Convention Center, where we found a corner to hunker down and visit to do this interview. 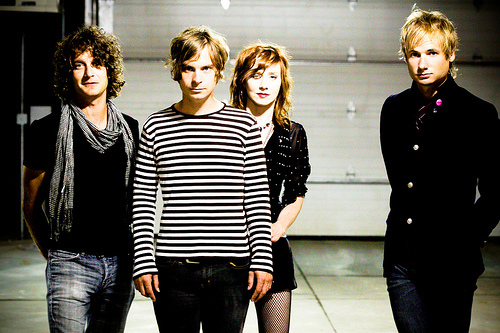 Meet (Left to right as they are standing in this photo), Ron Caron, Ryan Smith, Pony Hixon Smith, and Mark Wade, the Melismatics. Bronson: What a show last night, man. What was the name of that place? Bronson: Lamberts, boy you guys kicked, I enjoyed it. Almost just as much as I enjoyed trying to find a place to park so I could see you. Bronson: So you were in Kansas City before you come here? Ryan: That's right, yeah we played Kansas City on Monday night. Bronson: What room was that? Bronson: Very cool. And when you leave here you'll be going to? Bronson: And what room is that? Ryan: That is one of our favorite rooms in the country actually, it's The Rendevous. Bronson: So I know you've had a lot of things happen for you in the last few months. Just recently the MTV thing? Tell me what was the actual premise of that? What was it called? Ryan: Freshman. Yeah, there's a program on MTVU, it's called the Freshman. Every week they pick 5 new music videos, people vote on one that gets automatically added on regular rotation and our video for "Digging Deep" got the winning vote, so it's now on regular rotation on MTVU. Bronson: That's awesome man, and also you had a special on Channel 4 was it, up in Minneapolis/St. Paul? Pony: Yeah, WCCO, Channel 4 News. It was an interview, or sort of a piece. They interviewed us but it was on me growing up with deaf parents and what it was like for them. Bronson: Yeah, well that was very cool though. I watched that and it very very moving and that was very cool in the "Digging Deep" video how you do that signing in the back ground, that's awesome. Bronson: So the plans for the future of the Melismatics? You gotta a new record you've been working on right? You're been writing a new record? Ryan: Yep, yep. We're working on a new album. We've got plans to make a video in June, basically start getting new music out as soon as possible. Working on a new album, touring, the whole works so, try to follow everything up. Bronson: I know myself with Iowa HomeGrown Music, our publishing house, we've been working with you Ryan, for 11 years now, we're into the 11th year. Bronson: So this new record, what would it be, number 6? The 6th album you'll be making since I met you? Ryan: Yeah, it would be. I mean officially as the Melismatics, this would be our 5th album, but yeah, but actually so really the 7th if you want to go back into time that far. So yeah actually 7th. Bronson: So what do you think's happened the most from that first record to now, I mean as far as your music? Where do you think it's taken you the most? Ryan: Well that's a tough thing to say. This band has really come a long way, I mean I think the live show. What we've done with touring, we've just had a lot of really cool experiences. We got to play Lollapalooza, making music videos and stuff like that. We've just had a lot of really exciting things that we've been able to do as a band over the last, since we started. Really the band started in '01 or so and I think we've scene a lot of stuff. I don't know Mark, what do you think? Mark: Yeah, I mean it's kinda just been a gradual step up you know, with every kinda thing we do, and so, just kind of a gradual rising. Bronson: Well I know with "The Acid Test", you went out to California to record didn't ya? Mark: Yes, that was very fun. Bronson: With producer, John Fields? Bronson: And part of it was cut up in Minneapolis too? Mark: It was about 50/50 I'd wanna say. Bronson: So what do you think about the difference between recording in L.A and Minneapolis? Ryan: Weather. (much laughing), The swimming pool in the back of the studio in L.A. (much laughing). Ron: Yeah it's a little different then the Minneapolis studio. Both great studios though. Mark: I think we might have been a little bit more focused in L.A., just because we were, you know, staying at the studio, in the house that was connected to the studio. So we kinda just like we were living and breathing, recording the music. But when we're in Minneapolis, it's like we all go to our own houses when we're done recording and then come back the next day, so I think it's a little bit more focused in L.A., I mean it was all great. Those were the differences. Bronson: Ron, what do you think? You prefer playing live or in the studio. Do you have a preference? Ron: Completely different animals, I think there's great joy in both of them. It's fun working in the studio, it's more meticulous, where live is more of a energy thing. You're interacting a lot more with each other live so it's exciting in that way, and you've got your fans who on your side hopefully. In the studio you're just kind of, you know, everybody. gets their turn at their track and everything gets really analytical. It's just two different things, I don't prefer one over the other. I enjoy them both in their own way. Bronson: They have their own place. Bronson: Yeah, I think the kharma of a musician myself, I think it's the same, a little bit of both is real good. It kinda keeps you sharp on the other, you know? Ron: Yeah, and you're constantly learning in both worlds. Bronson: Kat. You've been singing a lot more in the last couple years then what you did in the beginning. How do you find that, do you enjoy that? Pony: I love it. I feel like I've more of a place in the band and that's what I've always wanted with music, and either way if that wouldn't have happened, I would have strayed off. But, I think it's important to me. Bronson: And you're also writing? Pony: Yeah, yeah. I'm writing a lot now. Bronson: And you're doing some other things, other projects, right? Pony: Yeah, I'm just recording and it's for commercial type of music at a studio called In The Groove, and just trying to write some pop music in the vein of like the Ting Tings. Basically the music's already written so I don't get to write the music, except the vocal melody, and Ryan helps out with that too. Bronson: Well SXSW. This is your 4th time, is that right. 3rd time, 4th time playing? Ryan: As The Melismatics, yeah probably the 4th. We've played in other groups that have played down here too so it's been, The Melismatics we were first here in '02 I think, wasn't it? Ryan: '01, Okay yeah, '01. Ryan: (laughing) Yeah I think we've been here every year, except for maybe 2 years, in some configuration. I don't know, I don't remember if the Melismatics played every year but like, I'm sure we didn't, but we played here with our friend, Mark Mallman, a few years. Yeah we've been down here, we've been comin here a long time. Bronson: And you did 2 shows this time. You played yesterday afternoon, then you played at night. Then today you're going to a big party, showcase type scenario, with New West Records. Ryan: Yeah, we're just going to the New West day party. Bronson: And you've got 2 more interviews to do? Ryan: 2 more interviews today. Bronson: You guys are popular man. Kind of in demand, huh? Bronson: I know you're not partying while you're down here. I know that. Melismatics: Of course not, oh no no, we'd never do that. Bronson: Sit in the hotel room, right till show time, yeah, then head right back. Bronson: (laughing) I think it's probably the biggest it's ever been. I think every year it gets bigger and bigger. Bronson: I payed $25 to park to watch you yesterday man. I feel like I oughta get some kind of like a refund. Bronson: Free cd or something. I mean, a bumper sticker? Ryan: We'll get you a free cd. Bronson: (laughing) So is there anything you have coming up that you want to promote? Any certain shows coming up that you want to talk about or any events? I know we have a interest right now in someone, in a new movie that they're wanting to use one of your songs. Ryan: Yeah, that's something to talk about. We're in the midst of solidifying the paperwork on that movie called, Removal. Elliot Gould. Bronson: Man the trailer on that looked great. Ryan: Yeah, looks like it should be a good movie so we're excited to be a part of that. Other than that like, check out the new video. Go to mtv.com, go to fuze, is it fuze? Ryan: Check out the video there and what else, what else can we promote? Bronson: Well you've got your own web site, which is www.melismatics.com. Bronson: And then you have your myspace.com/melismatics. Mark: Yep. Facebook, Twitter, all that. Ryan: I think if you go to our main web site, I think there's links to everything on there. Ryan: Right, so if you go there you can find whatever you're interested in. Twitter, facebook. Bronson: You're out of Minneapolis/St. Paul, but how do you find your response when you're going to these different towns around the country? Do you feel like it's going well for you? Ryan: I feel like in most cities that we've been hitting consistently it's going really well, in other cities. I think because in a way it's an asset to not be from that city because when you go there people are more excited that someone from another city's coming there that they wanna actually see. It's cool so, I don't know if you guys agree. I just feel it's a little more exciting actually to play in other cities. Minneapolis, we've been there so long. It's still fun, it's our hometown, we love it, but I mean, it's more fun to play in other cities. Bronson: You get to test the music out there in those other places where they don't know you from Adam, right? Bronson: It's got to be huge to feel that endorsement of it when you go back to creating some more. What about your upcoming shows? What upcoming shows do you have when you get back up to the cities? What's your next? Mark: Oh we have March 26th at Sauce. Then we have April 18th, I wanna say, at First Avenue for a benefit. Bronson: Those are both in Minneapolis? Pony: I think it's the 17th. Mark: The 17th, yeah, whatever. Ryan: You know if you print it, you can print either one. Mark: Again, refer to melismatics.com, it's all there for you. Ryan: All the shows are on the web site, we'll go with that before we spread misinformation. Ron: There's traveling with that as well. There's road dates other then those Minneapolis shows as well. I think we go to Indianapolis coming up. Ron: Chicago coming up and then hopefully get down to Nashville in the next 3 or 4 months out. Ryan: (laughing) Yeah, we've been hoping to get there. For some reason, every time I talk to our booking agent I say, hey, let's get this Nashville show happening. So yeah it'll happen. Bronson: So if somebody wants to book you, how do they get ahold of you? Ryan: I think on our myspace, on our web site, there's contact info for our booking agent. Bronson: And who is your booking agent? Bronson: Right. So anyone listening that wants a great band in their living room, 'cause I'm sure you'll do house parties, right? Ryan: We also do Bar Mitzvahs. Bronson: Or if you have room for people when you're traveling through town to stay, or if you want to feed a band. Bronson: You know, you know where to go. Mark: We've done a wedding, we've done a couple of weddings. Ryan: We actually have, we really have. We have done weddings. Ryan: Yeah, we are actually doing someones, someone in Dubuque, Iowa. Like we play this club in Dubuque, Iowa and it goes well and we have a really good draw in that city and it's some people that go to shows there want us to play at someones birthday party. They're hiring us to play in their back yard. Ron: That's the light show I guess. Bronson: That would be so much fun though man. Those gigs, you know you can't get better then those. Bronson: They they feed you good, they pay you good, you know. Everybody loves you, you're the life of the party, right? I love that kind of stuff. So this year at SXSW, do you think there's anything that's gonna happen this year any different from the other trips down here? You think you're gonna get any juice out of this year? Ryan: I think I look at this year as just an opportunity to reconnect with a lot of people that we know already. You know maybe we'll rub elbows with some new people, but for me, this year it's more about, there's like bands that we've toured with that this is just an opportunity to meet up with everybody and say hello. That's my personal opinion of it. It's funny because I always thought like well SXSW, there's that old stereotype that like, that's where you go and you make some huge connections, and it rarely, rarely, ever happens but we actually, you know, 3 years ago when we played here, that's when John Fields, the producer, saw us play, and that was like kind of a miracle out of that. You never know but I never expect anything like that to happen, per say, but yeah. Bronson: You've had a couple licks down here from people seeing you. You've had a couple different things? Ryan: Yeah, there have been a few things and they've all paid off really well. Bronson: Well there must be what, 6 or 7 thousand bands down here? Bronson: I mean it's incredible, biggest it's been. I appreciate you guys doing this. This is the Melismatics that I'm talking to ya'll. Minneapolis/St. Paul, Power Pop at it's finest. The greatest unsigned Rock band in the United States of America, in my opinion, and thank you for doing this. Bronson: Ron Caron on the drums, we got Kat Hixon on keyboards, guitar, vocals. Ryan: Also known as Pony. Bronson: Also known as Pony. Ryan Smith, who does most of the songwriting, lead singing, plays guitar, and Mark Wade on the bass. Thank ya'll.